During this quarter, our Ballast Atheneum has focused on many aspects of cash flow planning, including: budgeting, retirement savings vs. paying down debt, costs of vehicle ownership, and cash flow planning vs. long-term care. This week’s Atheneum article shares a case study that we try to create for working clients. We have implemented this Retirement Auto-Pilot for many people and have found it be both successful and realistic. Promise oneself to stick with debt payoff/savings plan. No new debt during the early years of the plan. Reward yourself! After you have accomplished the state goals, take a percentage of your extra wages/bonuses and spend it on enjoyment, entertainment, and something fun. Only allow “lifestyle creep” to occur with increases in pay and/or bonuses. Please review the case study below. If you believe you could benefit from this type of analysis or you believe someone you know could benefit from this type of analysis, please do not hesitate to contact our office. John and Jane Dentists, both 35 years old, are both working dentists who have been fully employed for several years. Their combined gross income is $200,000 ($100,000 each) and they are both maxing out their 401k’s at work. John and Jane were not lucky enough to have parents that helped pay for their college education (undergraduate or dental school) and have roughly $145,000 in student loans remaining. In addition, John bought into his dental practice and has a bank loan for $50,000 remaining. John and Jane worked hard during their undergraduate studies and dental school and wanted to reward themselves when they both finished. They decided to purchase a $200,000 home and bought two BMWs. Even though they are comfortable with their current gross income, they want to make sure that they are always making the best financial decisions and are planning for the life of least financial resistance. They are both unsure how best to save for retirement, when to start, how much to save, how to pay off debt, and whether or not they spend too much money. -What do I do with the excess cash flow? -How should I be paying off my current debt? Should I maintain the debt? Should I pay it off early and if so in what order? -What is the most efficient, tax-beneficial way to save for retirement? Analyze the current situation, goals, desires, debts, and cash flow. Understand the needs and requirements of each goal. Assign a monetary value to the needs and determine implementable, sustainable strategies for achieving each goal. Tailor a plan to each individual/family that meets the goals and desires of the personal situation. The individually created plan should be easy to implement and monitor, while being sustainable for the long-term. Observe the benefits of implementing the plan with little stress or concern for the individual/family. Enjoy excess cash flow! John and Jane Dentists have several goals they desire to accomplish. The most important goals are to fund their retirement accounts adequately to maintain their current lifestyle at retirement, age 66. Since they both finished dental school with significant debt, they would like to plan to save enough to send their future children to dental school. In addition, they would like to quickly pay off debt within the feasibility of accomplishing the additional goals of retirement and college savings. Finally, if their income and previously discussed goals allow, John and Jane would like to purchase a vacation home in 15 years. Upon discussing these goals, John and Jane’s Financial Advocate at Ballast helped create the requirements necessary to retire at age 66, fund college savings accounts, pay off debt quickly, and work towards purchasing a vacation home. The tailored plan established a funding order for debt payoff and savings goals. It directed the dedicated cash flow from a single goal to shift to a new goal, once the desired outcome was accomplished. This allowed John and Jane to understand the required cash flow and helped accustom them to that cash flow continually going towards financial progress. Once the Monte Carlo tests, future projections, and other analyses were finished, the Financial Advocate worked closely with Jane and John to implement a funding strategy to achieve the goals. The plan was custom designed to fit their current income cash flow, current debt payments, and current funding requirements. After a few months, John and Jane became quite comfortable with the implemented plan. The funding requirements were directly withdrawn from their joint checking account after each pay cycle and were essentially burden-free. The plan was monitored by their Financial Advocate at Ballast, with updates every few quarters. The best part for John and Jane was that at the end of each month, they knew any leftover money was extra spending money. They no longer felt guilty for going on vacations, buying expensive “toys”, or going to Starbucks every morning, lunch, and afternoon for coffee. The following chart was given to Jane and John as a motivator and to chart the progress. 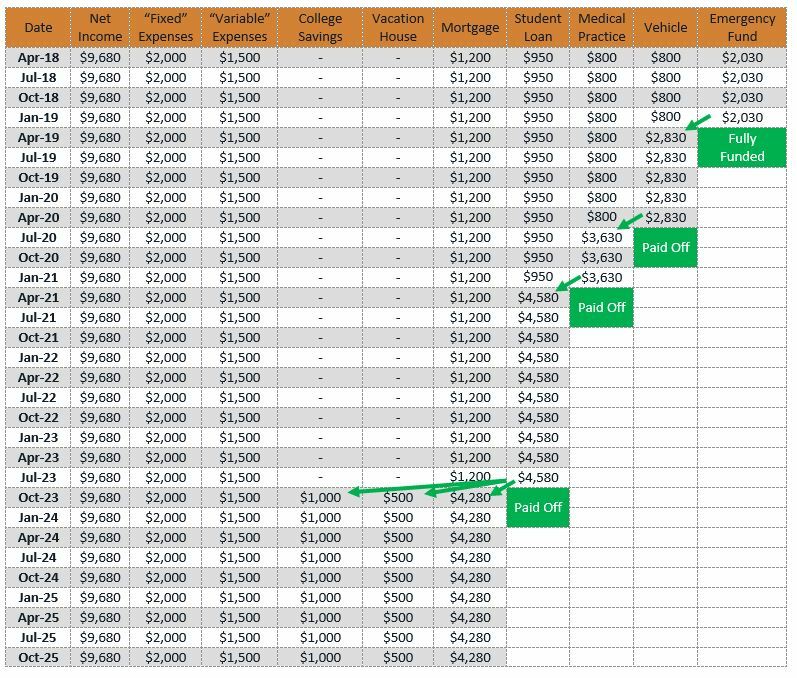 It clearly demonstrates that if followed, they will be debt free, excluding their mortgage, and working toward savings goals in six short years. *All strategies discussed and presented are completely hypothetical and should not be used to make recommendations on any specific individual’s financial situation. Please consult your financial advocate before implementing any components of the concepts presented. The information presented may not be suitable for all individuals. All numbers previously discussed are general in nature and were solely created for graphical and demonstrational purposes only.